There is no denying that pork and apples compliment each other. This kebab recipe takes it one step further by using an apple butter barbecue sauce. This is basted one as it grills, creating a delicious sticky sauce. A quick and delicious recipe for any occasion. Serve with a side salad or grilled vegetables and rice for ​a fast and delicious meal. 1. Cut off any excess fat from pork ribs and cut into 1 1/4" chunks. Place meat into a resealable plastic bag. Combine marinade ingredients and pour over pork. Carefully move ​the meat around to make sure all of it is well coated with the marinade mixture. Release air from bag and seal. Place into refrigerator for 1-2 hours. 2. While pork is marinating, prepare ​the sauce. In a medium saucepan add all of the sauce ingredients except butter, and bring to a simmer over medium-high heat. Stir often. Reduce heat to low and let the mixture simmer for 5-6 minutes until all ingredients are well combined. Remove pan from heat and stir in 1 tablespoon of butter. It will take about 10 seconds for it to completely dissolve. Cover pan to keep sauce warm and set aside. Right before kebabs go on ​the grill, remove half of the sauce from the pan for basting. The remaining sauce can be applied right before serving. 3. Prepare grill for medium-high heat. 4. I recommend using stainless steel skewers, but if bamboo is all you have available, make sure to soak them in tepid water for 15-20 minutes before using. 5. Remove pork from refrigerator and thread onto skewers. Do not overcrowd the meat. 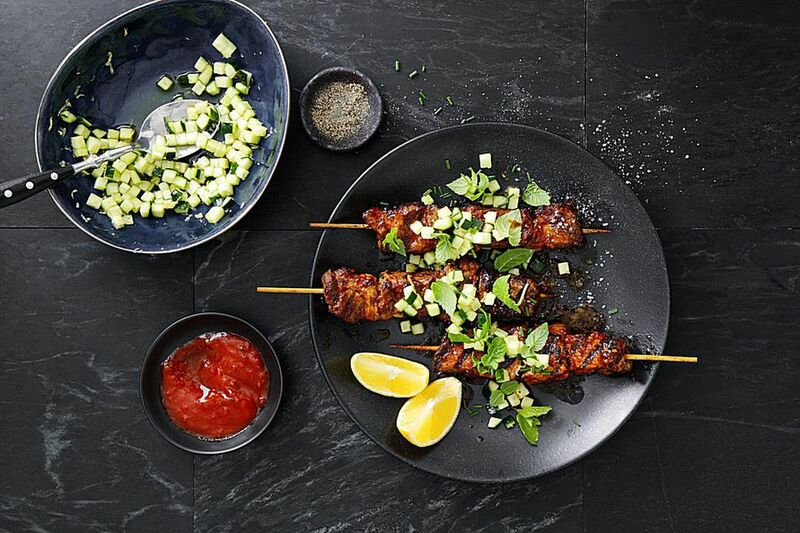 Aim for 4-5 pieces on medium length skewers and about 7 pieces on longer ones. 6. Place kebabs onto the grill and cook for 2-3 minutes per side. Reduce heat to medium and continue cooking for another 6-8 minutes. Begin applying sauce, turn and repeat the process every few minutes until kebabs have reached an internal temperature of 155 to 160 degrees F. Check multiple pieces and remove kebabs as they cook though. Keep warm by covering with aluminum foil. 7. Right before serving, reheat reserved barbecue sauce in the microwave for 15-30 seconds. Brush sauce onto cooked kebabs and serve immediately. Have You Marinated Your Pork Kebabs in Yogurt?